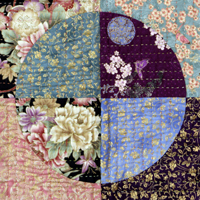 Once upon a time, when I was a fledgling quilter, I recall making my first quilt in blissful ignorance of what was to eventuate. Little did I know that it was the beginning of a life-long obsession, and the quilter’s tell-tale signs were already in place. At first, I thought I could make just one quilt, but as I stitched, I started thinking about the next one – and the next one after that. You guessed it, there came a day when I knew I had a problem. It started out innocently enough – I was cleaning the bath tub. As with most things menial, my mind wasn’t on the job. My mind was in a wonderland of fabrics, designs and quilts. In fact, my mind was so full of quilts I started to hyperventilate. It was a light-bulb moment. This was the moment I knew I was a quilter. Since that day there have been many more signs. 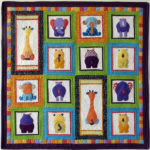 If you can relate to any of the following quilter’s tell-tale signs, then it’s pretty obvious you’re also a quilter. When you enter your local quilt store (LQS) time stands still. Hours pass without your knowledge. You leave the LQS with two fat quarters, a jelly roll and a charm pack even though you only went in for a spool of thread. You buy fabric just because you like it. You have fabric in your stash that you love too much use. You pat your finished blocks. You pat your friend’s finished blocks. You pat everyone’s finished blocks. Your vacuum cleaner brush has stopped spinning because of tangled threads. You dog/cat/toddler/husband have snippets of fabric stuck to them. 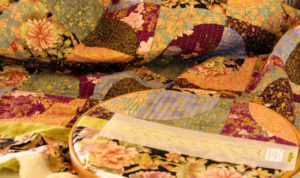 You can no longer eat at the dining table because it’s covered with quilts in progress. You wear your thimble to bed/work/dinner because you’ve forgotten you’re wearing it. You don’t go to movies anymore because you can’t sew there. The doctor/hairdresser/dentist picks threads off you before treating you. You look at someone’s dress/sofa/curtains and wish you could cut into it because it would be perfect for your block. You DON’T do mending and NEVER replace buttons. 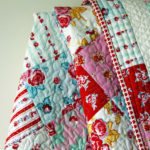 You want to quilt/stitch/cut every day and can’t imagine a life without quilting. 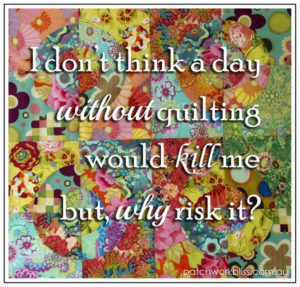 Keep quilting, my friends – it’s safer that way. Addendum to #14: You stalk men wearing Hawaiian shirts with a pair of scissors in your hand. I love this, Ted its that first quilt that gets you. It gets in your blood. Heaven help your checkbook when the LQS has a good sale. Spell check doesn’t like my words Ted should be yes. LQS’s are a trap but I love them and will take the risk!